Just like Fender and Gibson, Ibanez has its own instantly recognizable guitar lines, such as the RG Series, the JEM, and the S Series, of which today’s featured review is a part. The SIX6FDFM is also part of the Japanese brand’s popular Iron Label collection that has the tagline ‘Metal to the Core’ – a sentiment Ibanez hasn’t ventured too far from if first impressions of this impressive midrange model are anything to go by! As with all S Series guitars, the SIX6FDFM sports a beautifully sleek and well-contoured double-cutaway body that fits like a glove and is surprisingly light in weight. It’s made from solid mahogany with a flamed maple top that just peeks through the eye-catching Blue Space Burst finish (a purple version is also available). In fact, it’s a gorgeous guitar from head to toe, with a stealthy neck featuring no fret inlays – just the bound ebony fretboard that works its way up to the edgy Ibanez-branded reverse headstock, featuring the same striking finish as the body. The neck is built for fast players. It features Ibanez’s newer Nitro Wizard profile, which is incredibly low-profile and just super fun to play. This has a bolt-on three-piece maple/bubinga build and a total of 24 jumbo frets. The bottom line is that this Indonesian-made instrument is swift, comfortable and built like a premium model. So far, so good! If you ever needed proof that this Iron Label guitar was built for metal, just take a look at the hardware. The SIX6FDFM is loaded with a pair of DiMarzio Fusion Edge humbuckers at the bridge and neck position. These unique passive humbuckers with ceramic magnets are exclusive to Ibanez models. Surprisingly, the controls for them are limited to just a big ol’ volume knob, which is chunky and responsive. However, you do get a three-way pickup selector toggle as well as a mini coil tap switch, for a little versatility. The theme of ‘less is more’ continues as you move to the base of the guitar. You may be a little surprised to find that this guitar is fitted with a Gibraltar II fixed bridge as opposed to a tremolo system. However, what it lacks in divebombing ability, the SIX6FDFM makes up for in rock-solid tuning stability and lengthy sustain. Of course, this is complemented by the set of Gotoh MG-T locking machine heads up top. Providing you love metal, the sound that comes out of this baby is gorgeous. The powerful ceramic pickups are hot and punchy, although offer cleans that are surprisingly warm and compressed. As the gain gets higher and things get dirtier, the sound retains its clarity and crispness, with a tight low-end and decent treble tone. Ultimately, it’s ideal for modern rock and classic heavy metal. Bigger chords do come across as a little muddy at times when the gain is at its highest, but for power chords and single-note runs, it’s excellent. For under $1,000, the SIX6FDFM shows great value if you are looking for a fast-playing axe with killer looks and a punchy, mix-cutting sound. Ultimately Ibanez keeps things simple, but doesn’t skimp in any way – what you find is quality through and through. For more info about the Ibanez Series Iron Label SIX6FDFM, click here. 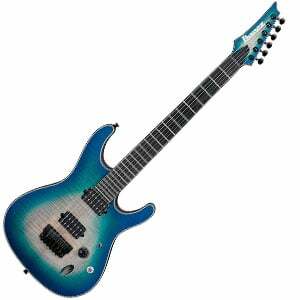 For more electric guitars under $1000, click here.